> > > > > > > > says KNL is 72 modified Silvermont cores, so it should be much better in that regard. > > > > > > > the cited 3 DP peak TFLOPS at a reasonable clock frequency (they would have to run at 2.6 GHz). > > > > > > Why is 2.6GHz an unreasonable frequency? 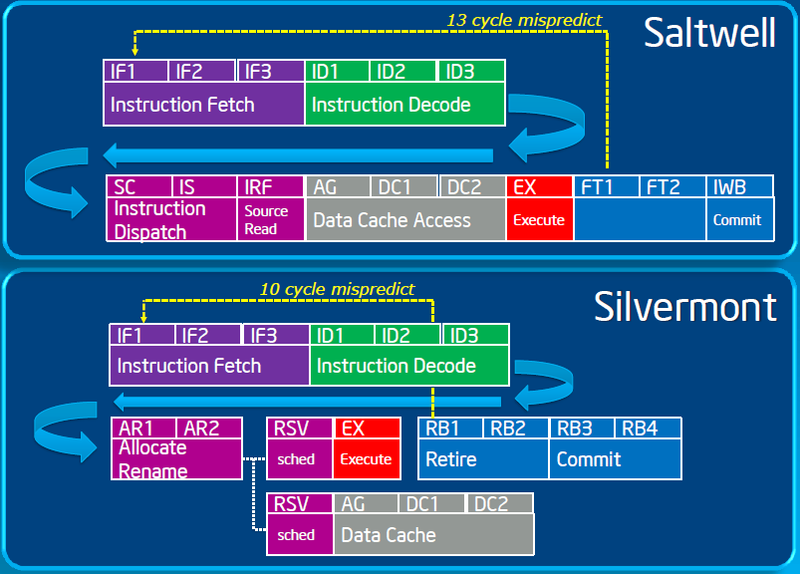 > > > > > > Intel's 14nm silvermont derivative is reported to have 2.7GHz clock. > > > > Silvermont cores alone, without VPUs, would eat over 150W. > > cores (plus 2MB L3, inteconnect, etc, but ignore that). > from power stand point? I personally don't see why not, but I don't know nearly enough. > be, even to E3-1220L v3, although this one probably don't need internal competition to sell poorly. > SKUs, one with TDP of 14W and the other, slightly more expensive, with TDP of 10 or 11W. > I prefer to compare C2750 with C2730 (TDP increase of 1W per core). > per core at 2.4 GHz (22nm) appear closer to reality than your suggestion of 1.5W. Maybe, but comparing C2530 with C2550 gives more than 1W per core increase, so there seem to be other components adding to the power increase as well. > > Then reduce power by 30% for 14nm. This is what Intel quotes. > > 2.6 probably brings power up significantly, but it seems 72 cores could fit into 100W. > Which still too high, considering 200W TDP for the whole chip. How much would wider vector units add, in your estimate? How would the power breakdown fit if there are 1.3GHz clocked cores? > > > > But why did you mention "2 wide vector units"? At 2.7 GHz one unit per core will do the job. > > 3 TFLOPS. If it runs at 2.6GHz, then it requires 1 vector unit.